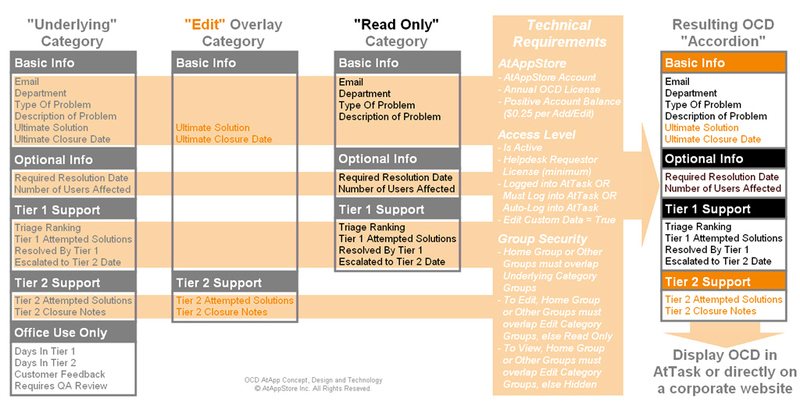 This tab shows a conceptual view of how OCD works, using a typical helpdesk scenario to illustrate what a Tier 2 support user would see and could edit in Workfront. This tab uses OCD to simulate an anonymous, untrained user raising a new Workfront Helpdesk Request from a corporate website. This tab uses OCD to illustrates the scenario in the OCD Concept diagram, where a Tier 2 support user is editing an existing helpdesk issue. This tab uses OCD to collect Workfront Performance and Usage information from visitors to the AtAppStore, then presents the results in two embedded Workfront reports.